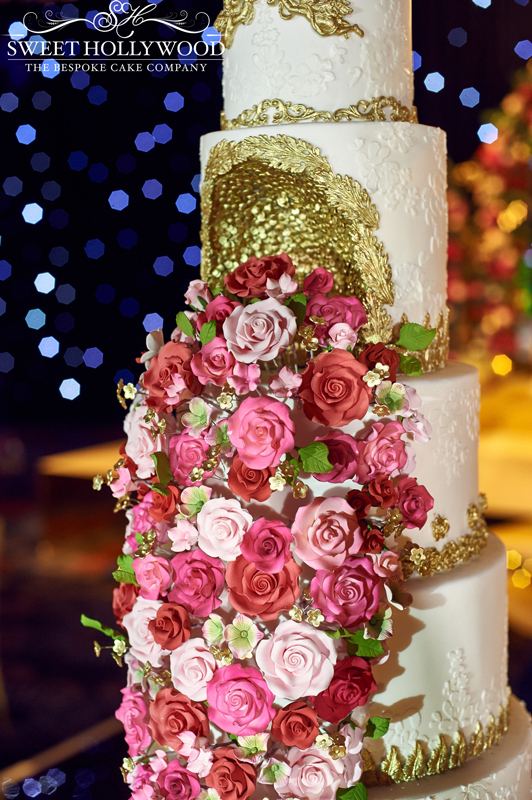 Sweet Hollywood continue to push the boundaries of Luxury wedding cakes in the UK with their latest concept and design by the name of Floral Waterfall. 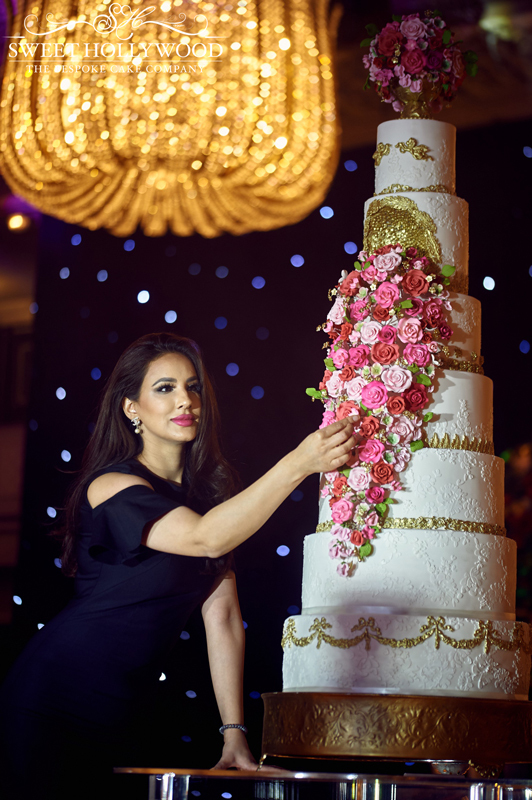 The grand wedding cake was another bespoke design from the London based wedding cake specialist, for our clients Rakhi and Tamkin’s glamorous wedding reception @ Grosvenor House London. 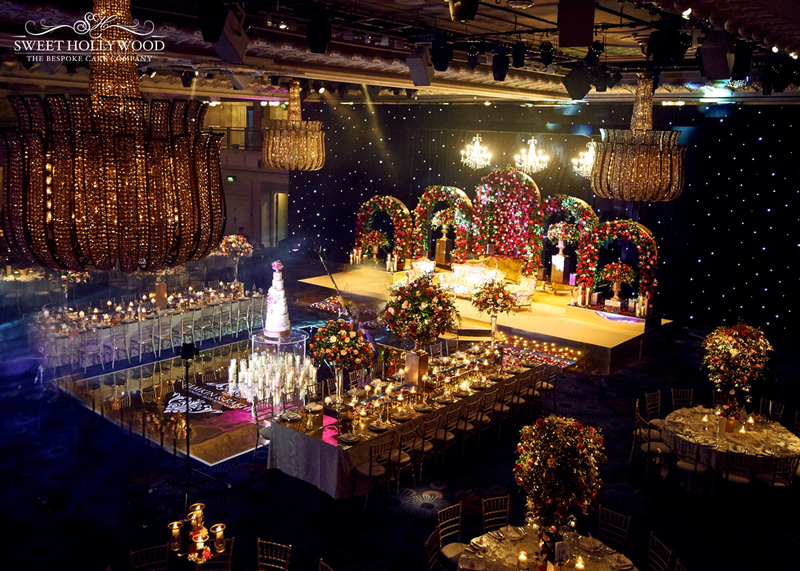 The wedding reception was held within The Great Room @ Grosvenor House and featured some of London’s finest wedding suppliers. Everyone came together to put on a fabulous wedding reception and make our client’s day that much more special. 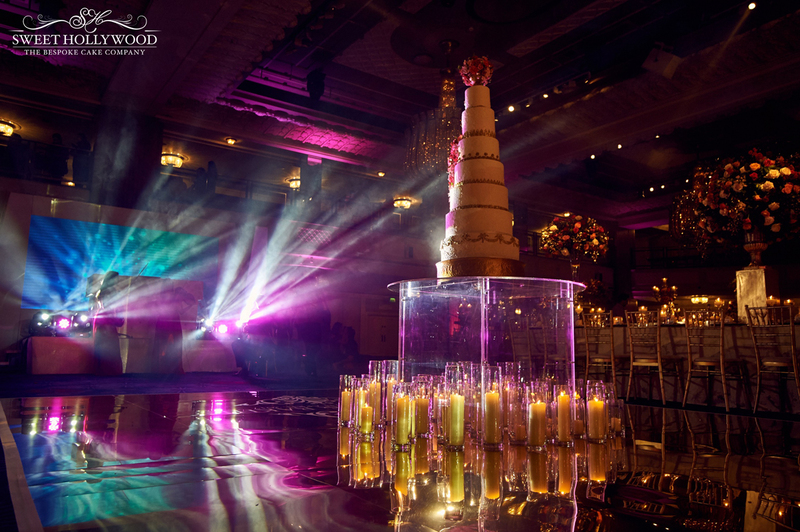 The catering was provided by the talented team of Sapna Caters, who cater and service the most delicious Asian wedding catering in some of London’s most prestigious Hotels and wedding venues. Zeeshan Tariq one of the directors of Sapna has a track record of success with the Sapna team and made sure the wedding reception and catering were nothing short of exceptional. 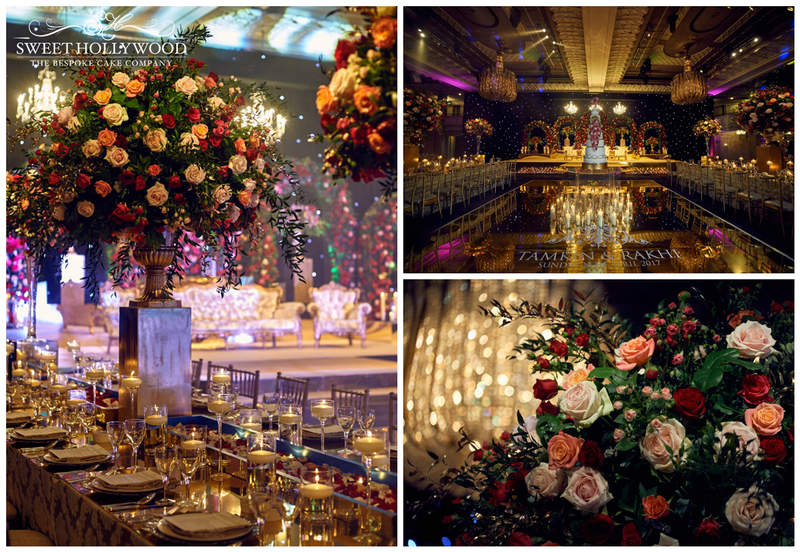 The Great Room @ Grosvenor House was transformed by the super talented team by the name of “Enchanted by Syma” The Luxury wedding décor specialists and wedding florists ticked all the boxes from original design and concepts that is a breath of fresh air to the Asian wedding décor market. 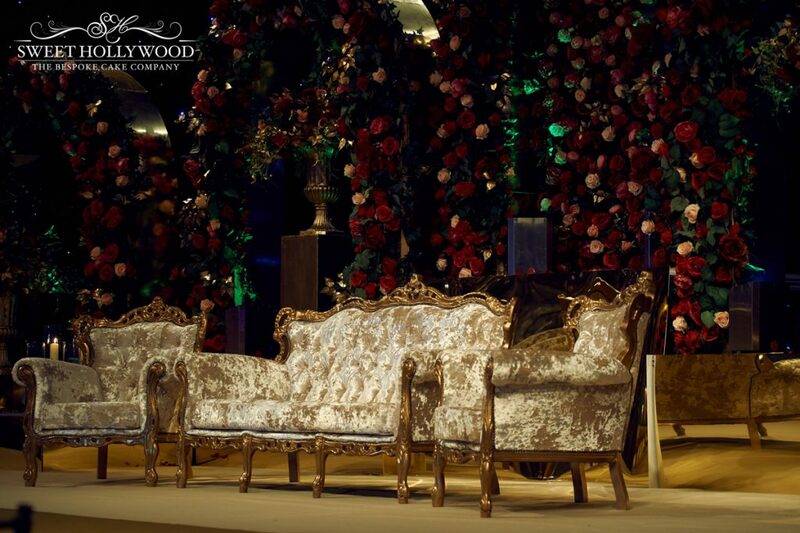 The wedding stage, an original concept from Enchanted by Syma team consisted of beautiful gold mirror arches that were adorned with floral arrangements, the stage was centred under the beautiful hanging chandelier. 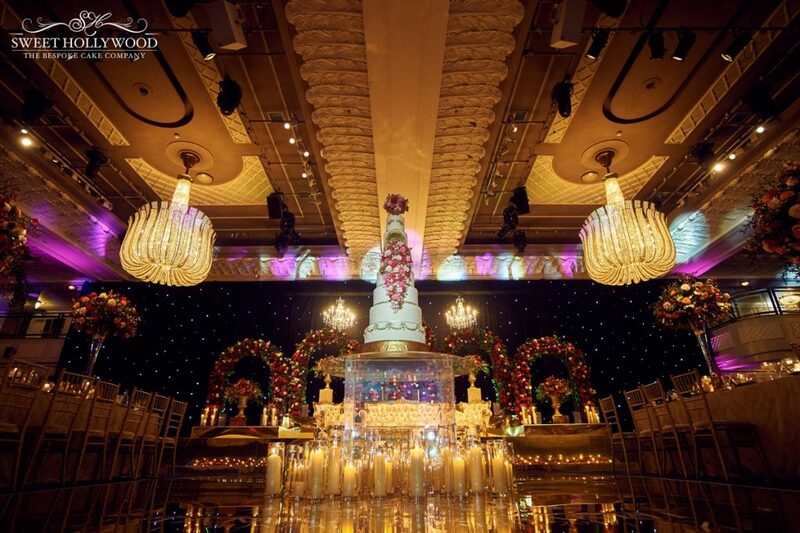 A gold mirror stage also created an opulent setting for the bride and groom which is a big wedding trend for luxury wedding décor and matched the dance floor where the Sweet Hollywood wedding cake was positioned. Entertainment was provided by Bee SounDs who put together a very clean and contemporary setup that complimented the look and feel of the event and entertained guests with a great selection of music. 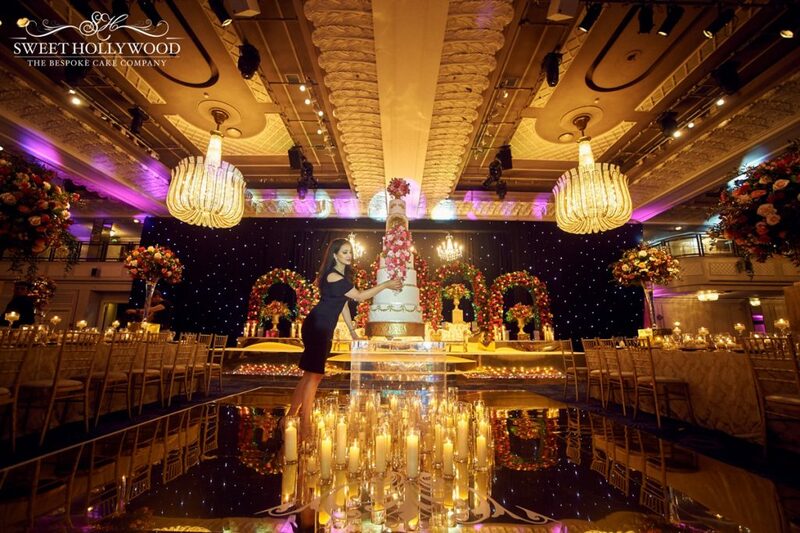 Proving wedding cake to feed over 550 guests is no easy task and Sweet Hollywood were selected to provide the bespoke wedding cake for the celebrations. Sweet Hollywood specialise in large wedding cakes and have an impeccable reputation for unique and original designs that set trend in the cake world! 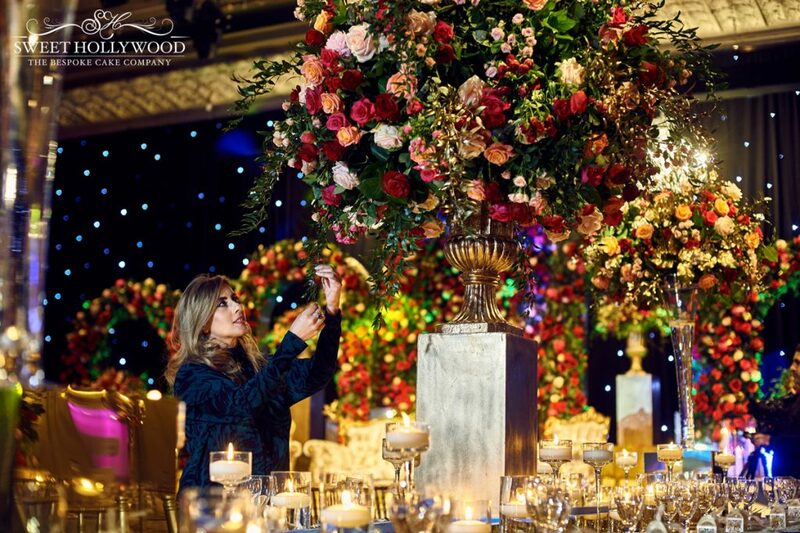 This masterpiece by the name of Floral Waterfall featured seven oversized tiers which are some of the biggest in the UK. The base tone of the wedding cake featuring stunning lace detailing that was requested by the bride. 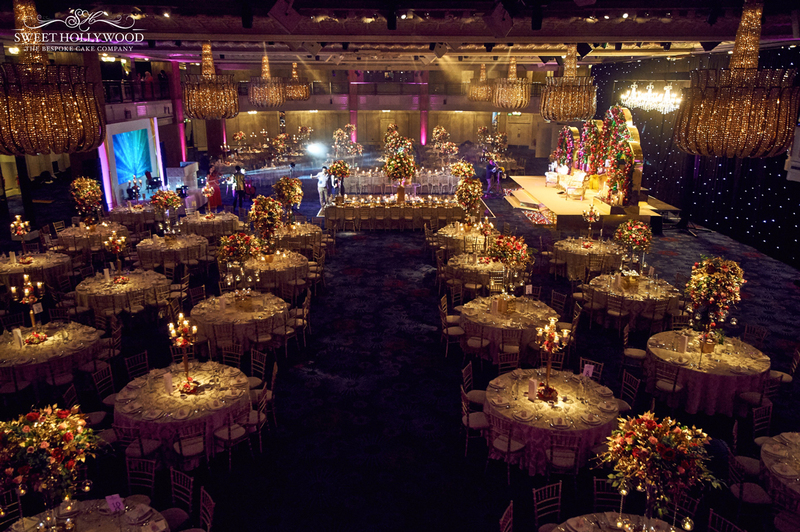 Hand painted gold sugar detailing complimented the look and feel of the Great Room and décor @ Grosvenor House. The focal point of the bespoke wedding cake was a sequenced alcove that was calved into the design that featured an avalanche of stunning sugar flowers that dramatically featured on the bespoke wedding cake like a waterfall. A crown of sugar flowers also featured on the top tier of the luxury wedding cake. adidas shoes uk Presentation is everything and the bespoke wedding cake featured on our floating table which is a registered design in the UK and our Romeo & Juliet candle display really added to that romantic feel of the wedding reception. A big thank you goes out to Indy Sagoo for these fabulous images.